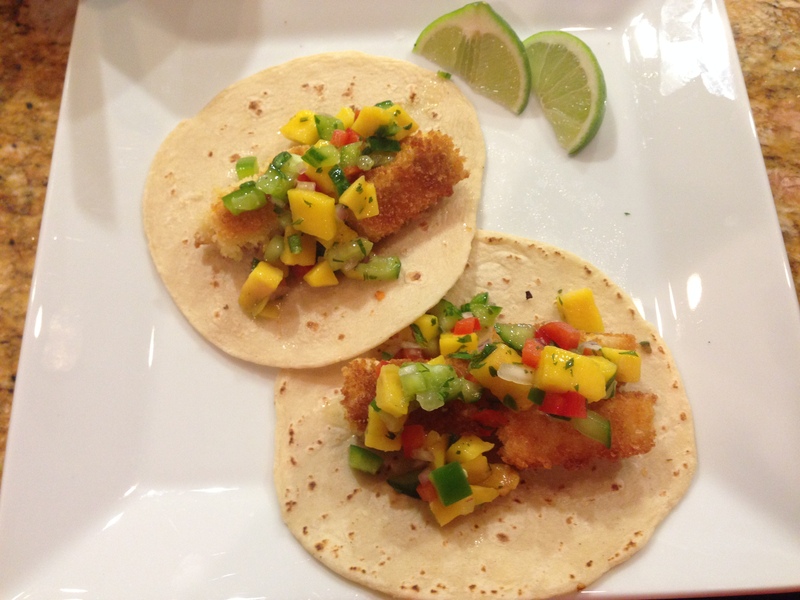 Crispy, full of flavor and a fun meal to eat, you will not miss the fish in this Vegetarian Tofu Tacos with Mango Salsa. 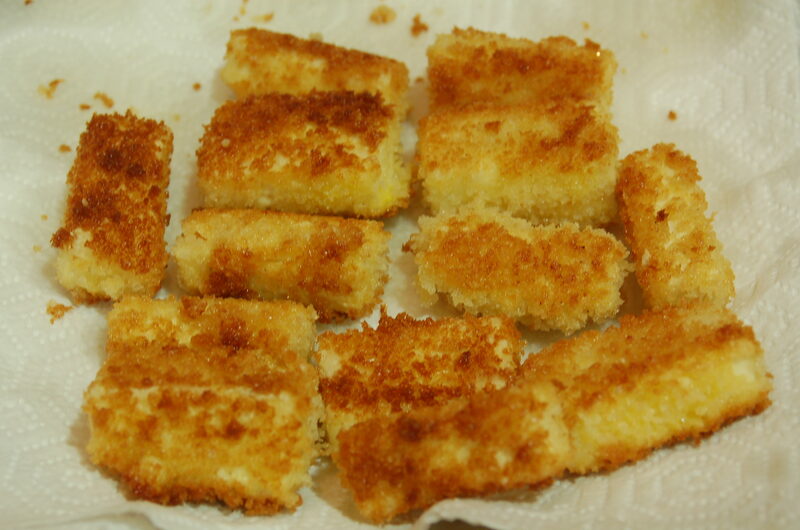 Coating the tofu with panko bread crumbs then pan frying them in oil yields a crunchy exterior and a tender interior. 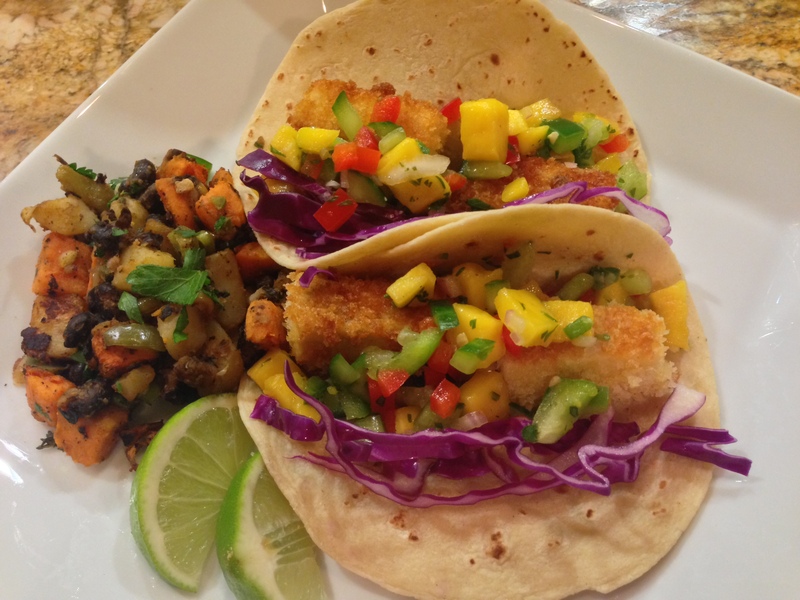 Layer the tofu with Mango Salsa and Purple Cabbage and Carrot Slaw which can be prepared in advance. Prepare the Mango Salsa. This can be prepared the day before. Prepare the Purple Cabbage and Carrot Slaw by whisking together the lime juice, vegetable oil, salt and sugar. Toss in the cabbage and shredded carrots. Set aside. Place the tofu in a sieve and pour boiling hot water over it. This will help draw out moisture. 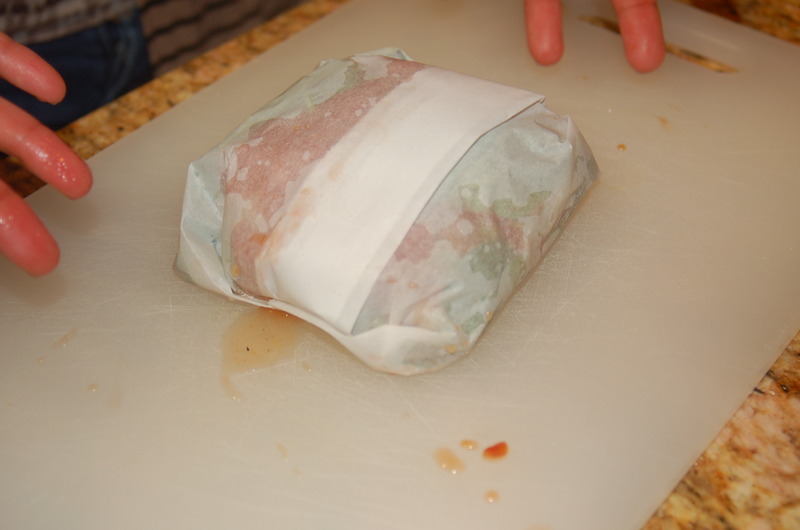 Dry out tofu by placing them in between paper towels and sandwiched in between two plates. Weigh the plate down with a 28 ounce can or something of similar weight for at least 15 minutes. In a shallow dish, combine the panko bread crumbs with cayenne pepper. Place the corn starch and lightly beaten egg, each in its own separate shallow dish. After the moisture is drawn out of the tofu, cut the tofu into 4 x 1 inch pieces then season with salt and pepper. Coat the tofu with the corn starch, then dip it in the egg and then coat it with the panko bread crumbs. Over medium high heat, heat enough vegetable oil to coat a non-stick frying pan. Test the oil temperature by dropping in a piece of the panko bread crumbs. The oil should bubble around the bread crumbs and start turning it brown. If the oil smokes, the pan is too hot. Fry the tofu until golden brown on each side. Drain on a paper towel. Warm the tortilla in a hot pan for a couple minutes on each side until warm. Assemble the taco by placing some slaw in the middle of the tortilla. Next add a couple pieces of the tofu and top with the Mango Salsa. Serve with a couple extra slices of lime, hot sauce and a side of my Sweet Potato, Bean and Corn Hash. 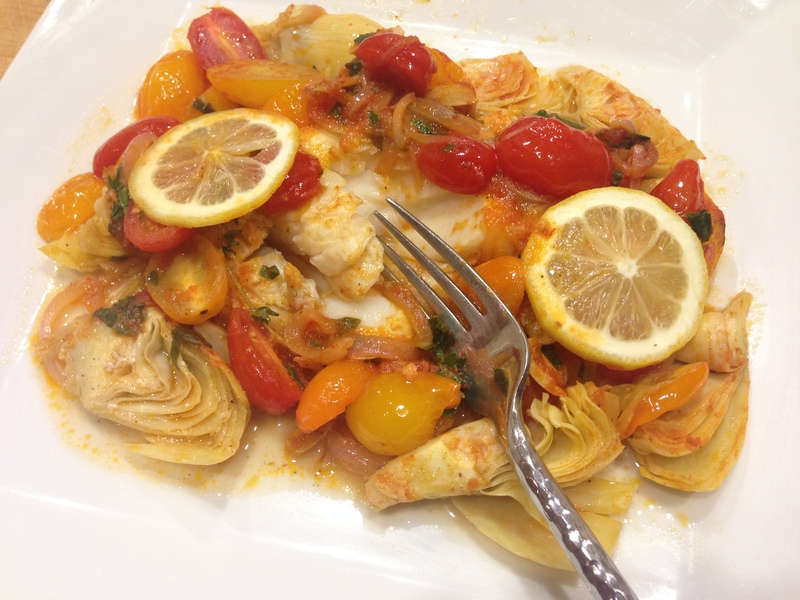 Leftover roasted vegetables are great ingredients to have in the refrigerator when you need to cook a fast and healthy weeknight meal. 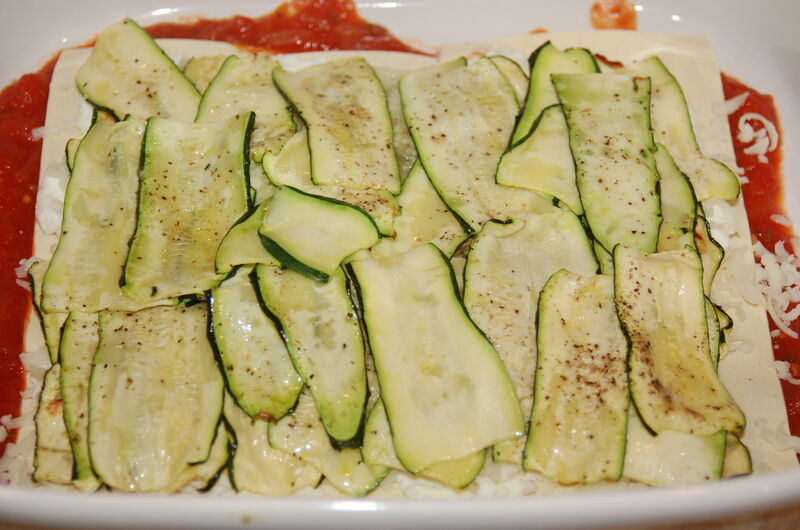 I had extra roasted zucchini and bell peppers left over after making my Vegetable Lasagna. The day after I made the lasagna, I used some of the roasted vegetables as a topping for homemade pizza. 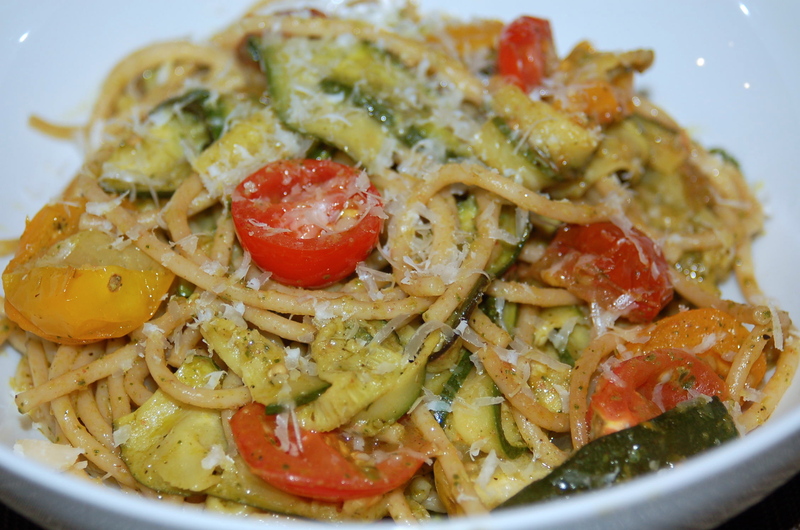 A couple days later, I used the remaining roasted vegetables in this Garlicky Roasted Vegetable Pasta with Pesto. The basil pesto used in this recipe can also be made in advance and stored frozen up to 3 months. I am not ashamed to admit that I used store bought basil pesto; in addition, I used store bought garlic paste since I like my pesto garlicky. 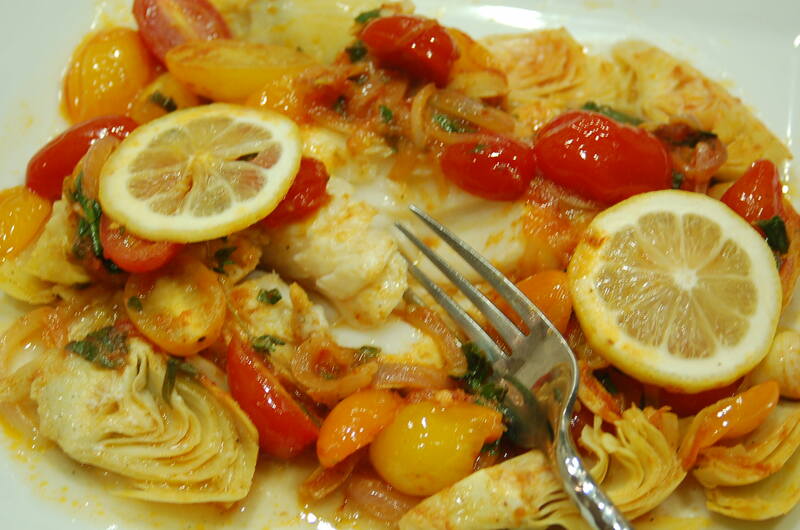 This healthy and delicious dinner was ready in 20 minutes. * Note: For directions on how to roast bell peppers and zucchini, follow the instructions on the Vegetable Lasagna recipe. In a food processor, pulse basil, garlic and pine nuts a few times until just combined. Then, while the food processor is running, slowly drizzle in olive oil. It’s important to do this slowly to ensure it will emulsify. Season to taste with salt and black pepper. If you are using the pesto immediately, stir in the cheese. Otherwise, store and freeze without the cheese. You can add freshly grated cheese once you are ready to thaw out and use the pesto. Cook pasta in salted water and drain. Add the pasta back to the same pot. 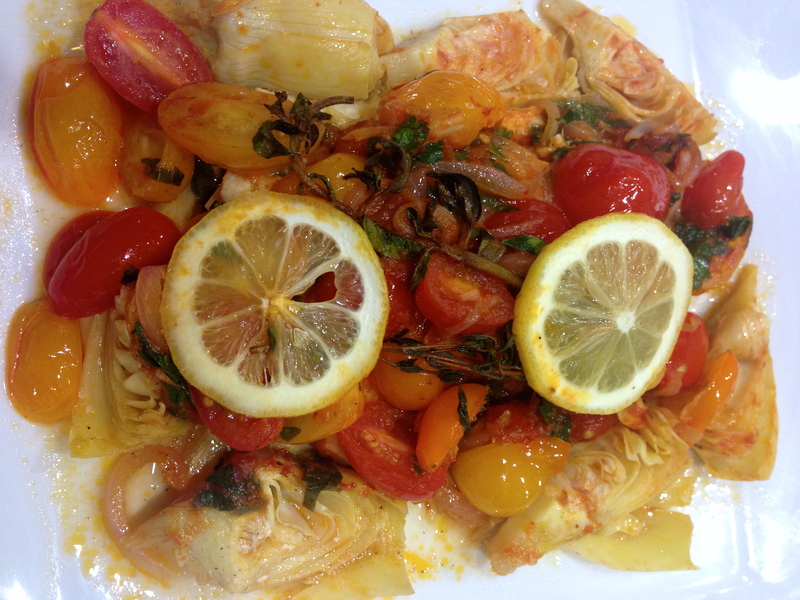 On medium heat, add the garlic paste, red chili pepper flakes, roasted peppers, roasted zucchini and tomatoes. Stir together and heat until vegetables are warmed through. Combine pesto and heat for 2 additional minutes. Just before serving, sprinkle freshly grated Parmigiano-Reggiano cheese. Left over roasted zucchini and bell peppers were also used to make pizza. I was challenged this holiday to come up with festive meals that would satisfy both vegetarian and carnivore hungry athletes at the same table. When I developed the menus, I had 3 requirements: 1) Each of the main ingredients’ attributes should stand on it’s own. For example, I’m not a fan of tofurkey, chick’n or any food being doctored up to substitute real meat. If tofu is an ingredient, then it should be prepared in a way that it can be savored; 2) The dish should be worthy of special occasions, requiring a little labor of love and; 3) The dish should be comforting. Voila. For Christmas eve, the main dish was Vegetable Pot Pie and for Christmas day, the main course was Vegetable Lasagna. Each of these recipes can be modified to include protein, such as meat or tofu. The lasagna freezes well and is a fast and nutritious meal that heats up quickly after a workout or for a busy weekday dinner. If you have extra mozzarella and Parmesan cheeses, make a little extra tomato sauce and roast a little extra zucchini and roasted peppers. 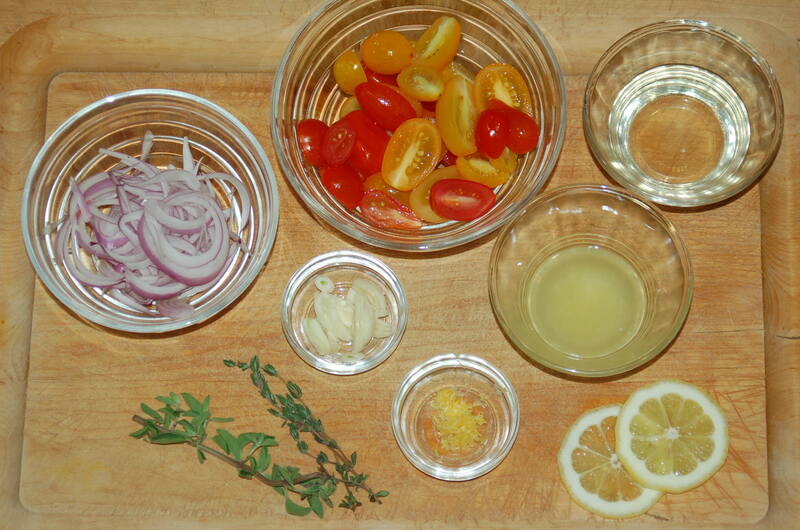 You can use these ingredients to make a nice pizza the next day. Here’s how I made the lasagna. In 3.5 quart French oven, sauté diced onion in olive oil over medium heat until soft and translucent. Add garlic and sauté for about 2 minutes more. 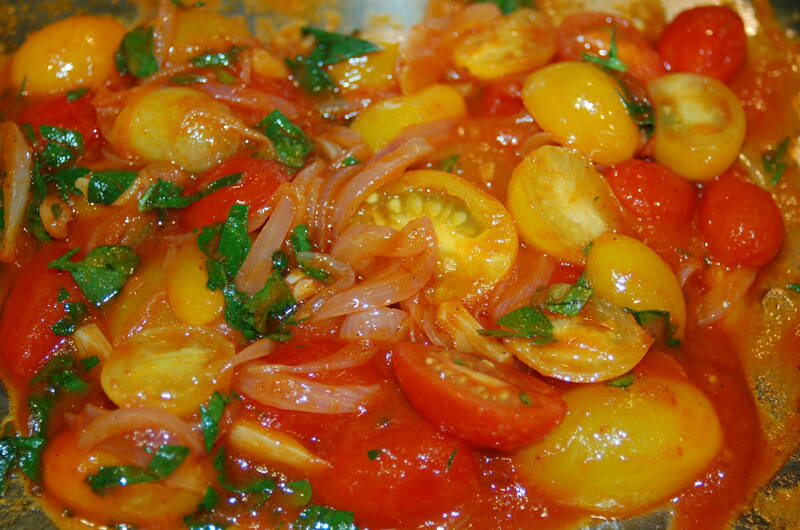 Add diced tomatoes, tomato puree, tomato paste, bay leaf, sugar, basil, oregano, thyme and red pepper flakes. Simmer, stirring occasionally for about 30 minutes. While the tomato sauce simmers, roast bell peppers. 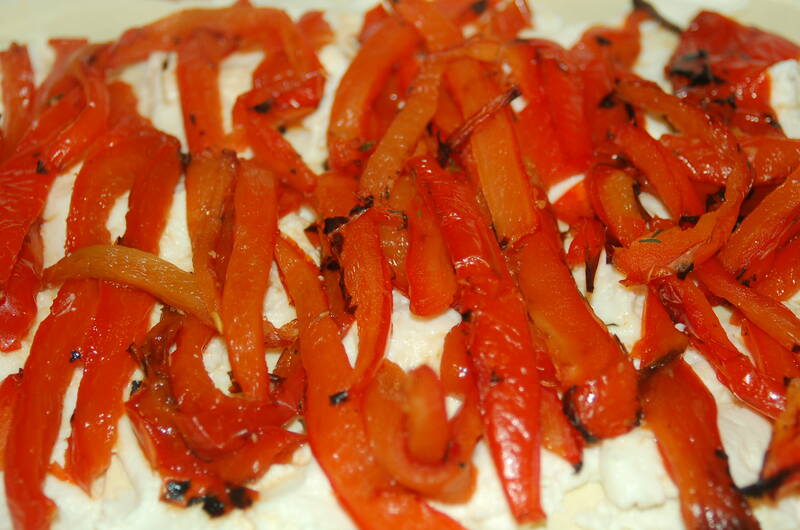 There are several ways to roast peppers. I like to blister the whole peppers over a gas flame. Allow the peppers to cool and remove the charred skin. I don’t bother to place them in a paper bag or cover with plastic wrap. It’s not necessary for this recipe to remove all of the skin. Core the peppers and cut into quarters. 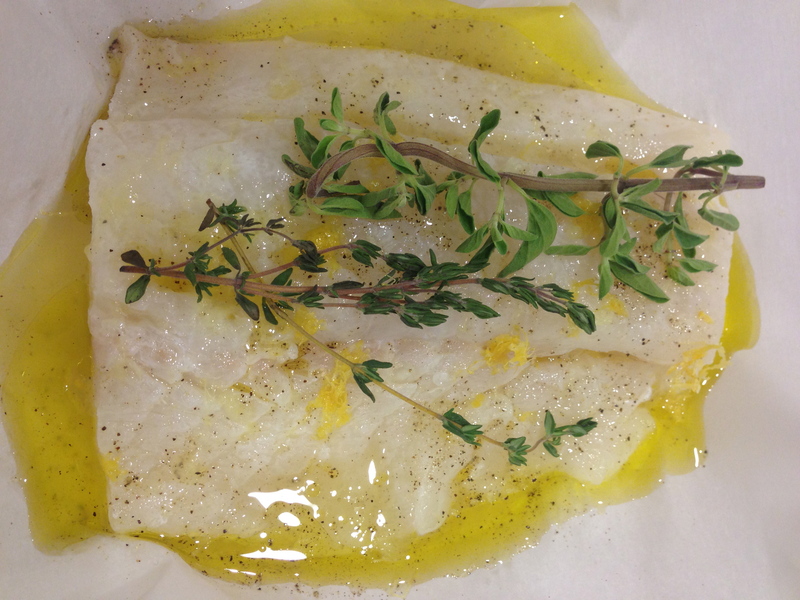 On a baking sheet lined with parchment paper, place the pepper quarters skin side up and roast in oven at 375F for about 20 minutes or until softened. Using a mandolin, slice zucchini into 1/4 inch strips. Brush both sides with olive oil and season with salt and pepper. Place on parchment lined baking sheet and roast in over at 375F. Turn over after 10 minutes and continue to toss until softened. 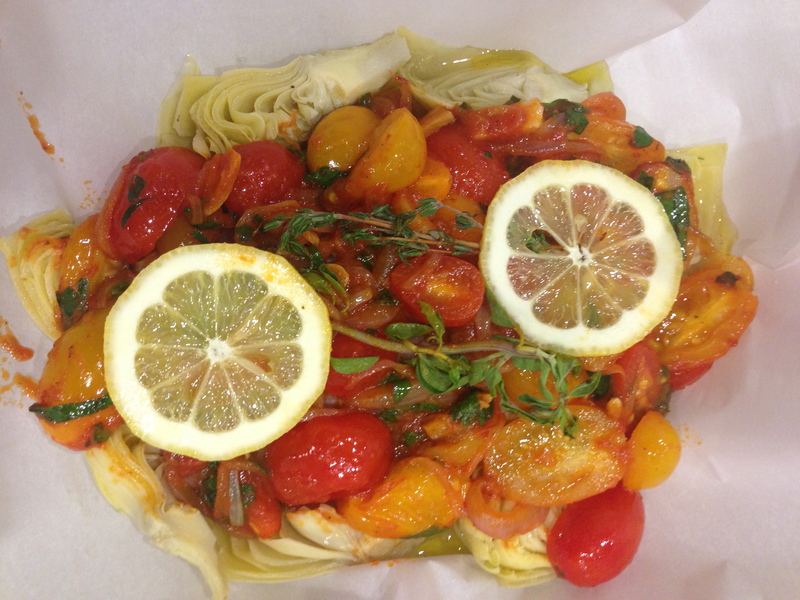 Remove bay leaf from tomato sauce. Coat the bottom of lasagna pan with tomato sauce. I used a 10.5 x 8.75 x 2.5 inch ceramic casserole dish. 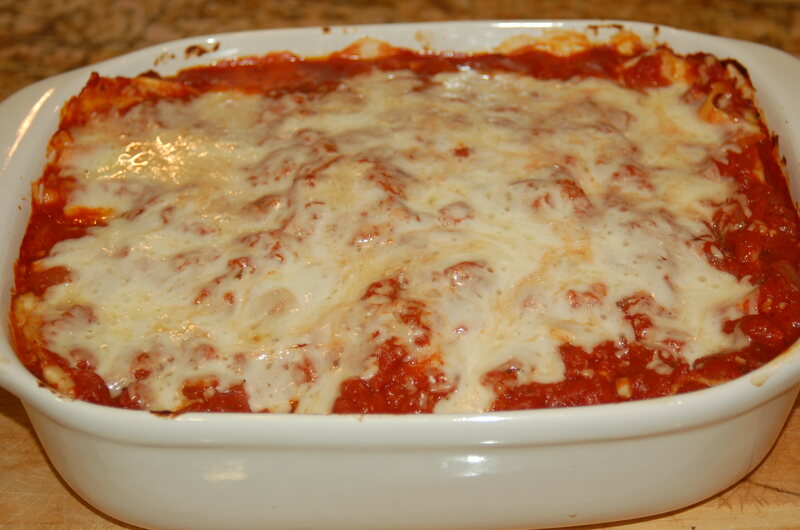 Place first layer of lasagna noodles over the tomato sauce, overlapping each noodle by ¼ inch. Gently spread ricotta cheese over the noodles being careful not to break noodles. Lay roasted zucchini strips. Sprinkle with mozzarella cheese and cover with thin layer of tomato sauce making sure to coat the noodles. 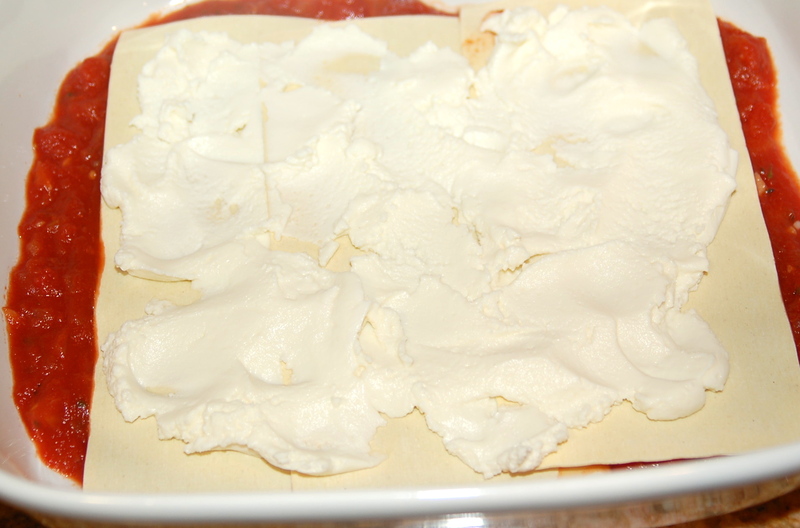 Gently spread a thin layer of ricotta cheese over lasagna noodles. 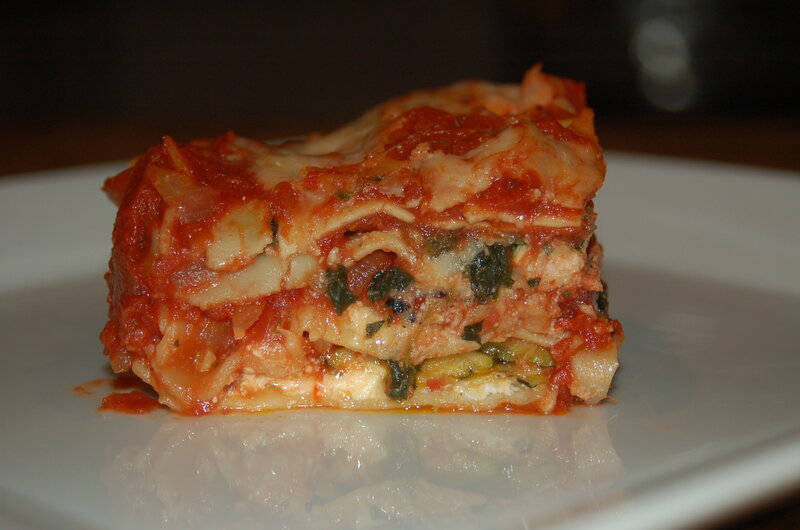 Place next layer lasagna noodles over the zucchini and tomato sauce. 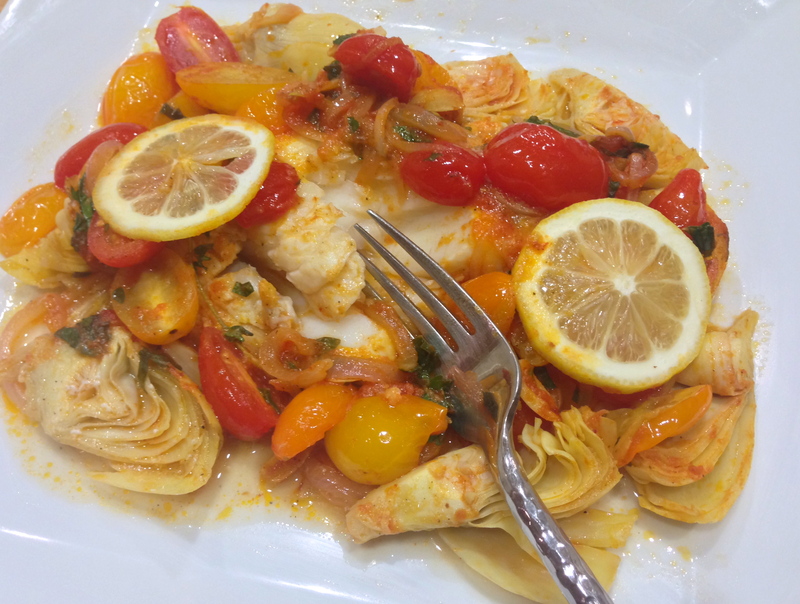 Spread thin layer of ricotta cheese over the noodles, lay roasted peppers, sprinkle with mozzarella cheese and cover with another thin layer of tomato sauce. Place third layer of lasagna noodles over roasted peppers and tomato sauce. 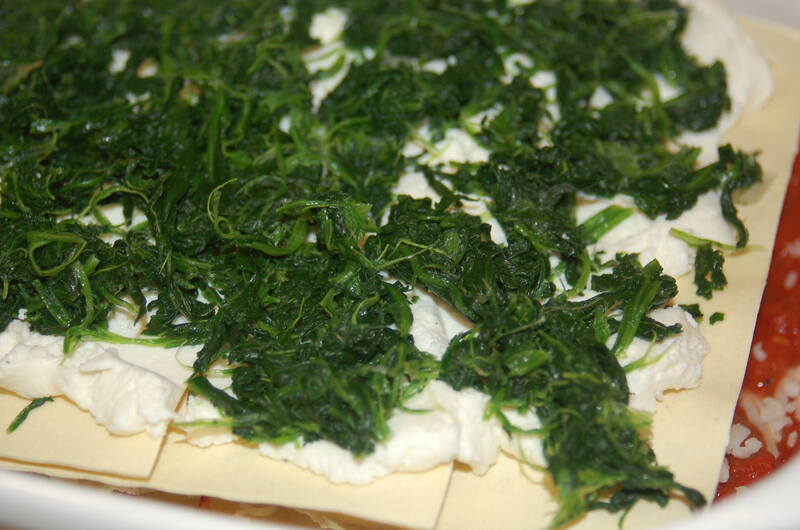 Spread with thin layer of ricotta cheese. Squeeze out all the moisture from spinach and spread evenly over ricotta and noodles. Repeat layering with mozzarella and tomato sauce. Place forth and last layer of lasagna over the spinach layer. Cover with remaining tomato sauce. Sprinkle with remaining mozzarella cheese and Parmesan-Reggiano cheese. Cover with aluminum foil and bake at 375F for 40 minutes. 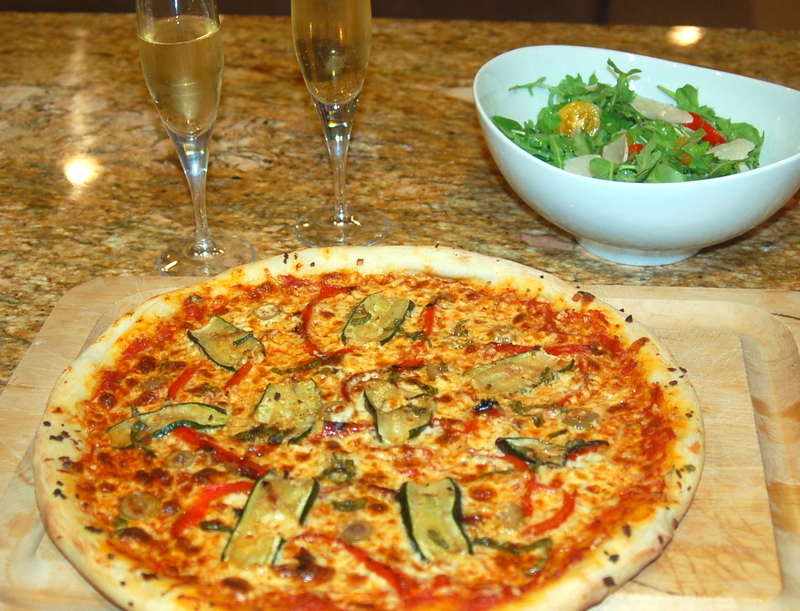 Use the extra mozzarella, parmesan, tomato sauce, roasted zucchini and roasted peppers to make a pizza the next day. Enjoy it with champagne like I did here. Thanksgiving kicks off one of my favorite times of year. As immigrants, my family was slow to embrace the American tradition of Thanksgiving. We really didn’t know much about eating or cooking turkeys. My mother made Peking Duck instead. It is one of my most favorite culinary guilty pleasures. Peking Duck is quite a laborious venture in the kitchen. The chore begins with my mother meticulously rigging a duck on a wire hanger and suspending it from a kitchen cabinet. Then over 2-3 days, the duck is basted and dried before it is roasted. The end result is the crispiest and tastiest skin that covers moist duck meat. However, one year, on day 2 of project Peking Duck, my mother went into labor with my sister. After giving birth, my mother asked my father what he did with the duck. He fried it. The story always makes me smile thinking how my mother went through all that effort to prepare the duck, only to have it deep fried. I suppose it’s no different than frying a turkey. Fast forward to 2014, and now I’m in a relationship with someone who also has never had a traditional Thanksgiving turkey dinner. He’s a vegetarian athlete and his only request was that I not prepare Tofurky. I wanted to create something nutritious, packed with protein (like a turkey) and Thanksgiving-y. Like my sister, my Acorn Squash stuffed with Quinoa, Roasted Butternut Squash, Spinach, Cranberry & Toasted Almonds was born on Thanksgiving day. Served with vegetarian side dishes, this main course satisfied my hungry athlete. Peel the butternut squash with a vegetable peeler. With a very sharp knife, slice off the top and bottom of the butternut squash to create a level surface. Then carefully cut into ½ inch cubes. Line a baking sheet with aluminum foil. Toss the butternut squash in 1 tablespoon olive oil and season with salt & pepper. Bake for 25-30 minutes until tender, tossing once. Microwave acorn squashes for 1 minute. Cut in half crosswise, dissecting the top and bottom. If necessary, slice a small piece off the top and bottom so that it sits level when served on a plate. Scoop out seeds and stringy parts. Spread 1 tablespoon of butter (or 1 teaspoon of olive oil) inside of each acorn squash half, then season with salt and pepper. 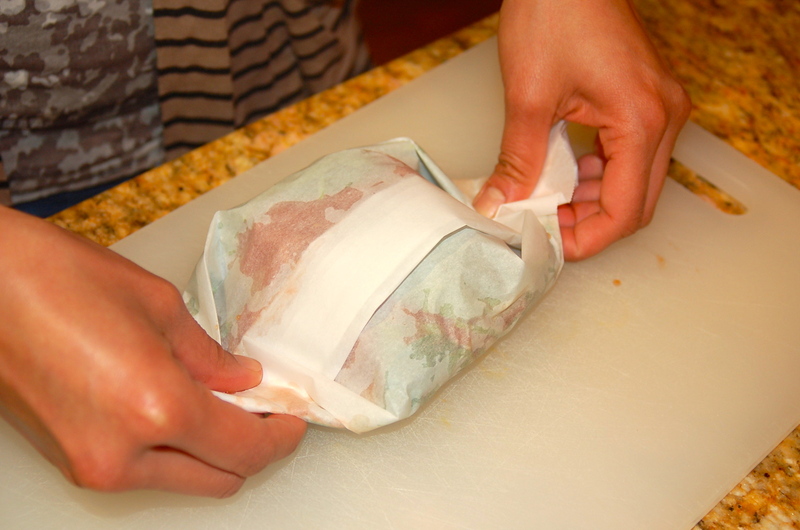 Wrap each half in aluminum foil**. Noting the amount of time left to bake the butternut squash, bake the acorn squashes for 50-60 minutes or until fork tender. The butternut squash will finish cooking and will need to be removed from oven while the acorn squash packets remain in the oven for it’s remaining baking time. The timing will ensure the acorn squash is still warm when served. Once the acorn squash are cooked and tender, keep them wrapped in aluminum foil to retain heat until the quinoa is ready to be served. Bring vegetable broth to a boil then stir in quinoa. Stir in dry mustard and curry powder. Simmer covered for 15-20 minutes until water is absorbed or according to the package directions. While quinoa is simmering, toast the almonds in the oven, on a baking sheet until lightly toasted and fragrant for about 5 minutes. Allow it to cool, chop coarsely and set aside. 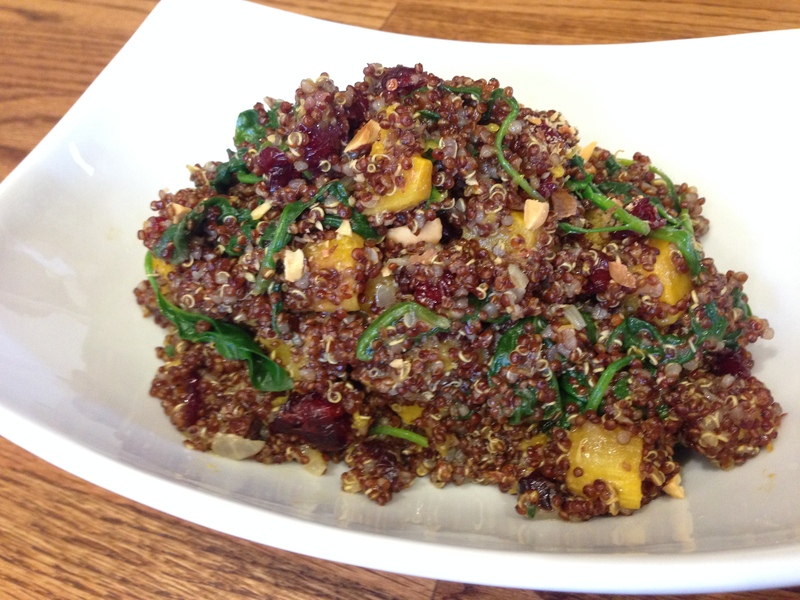 Once quinoa is cooked, remove from heat and toss in cranberries and stir in lemon juice. Taste the quinoa and season with salt if needed. I find that if the quinoa is cooked in vegetable broth, no additional salt is necessary. Cover and let sit for about 5 minutes. Remove lid and fluff quinoa with a fork. 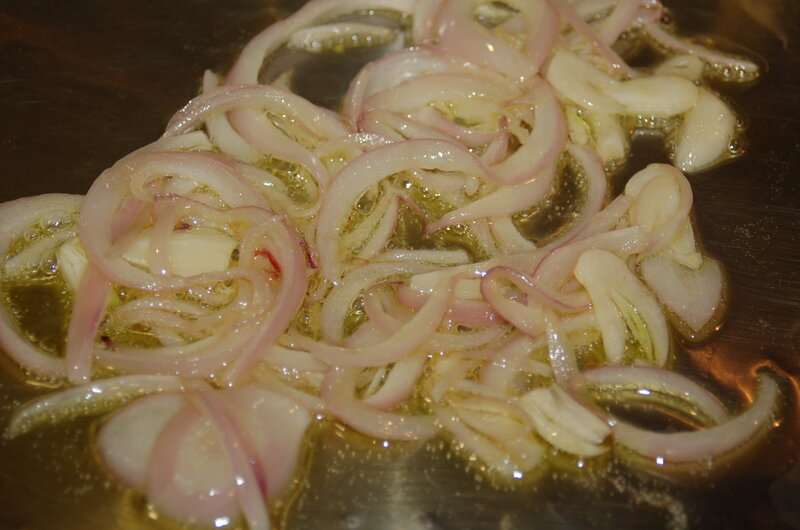 With remaining 1 tablespoon of olive oil, sauté shallots until softened. Add butternut squash, quinoa and spinach. Sauté spinach until wilted. Toss in toasted chopped toasted almonds just before serving. 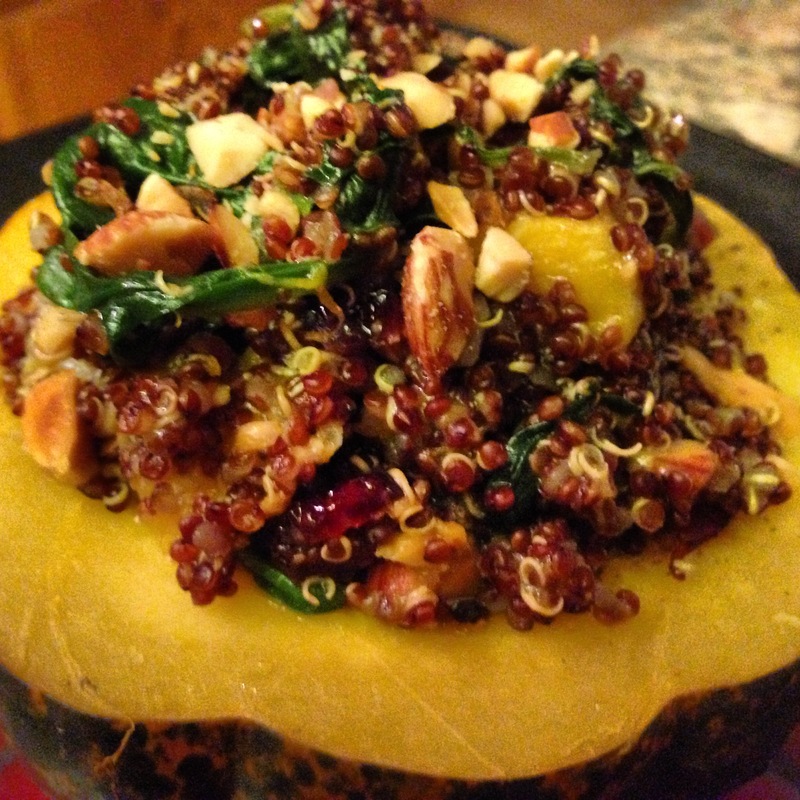 Spoon quinoa into acorn squash and serve. * Note: You may prefer not to include both butternut squash and acorn squash in this dish. I found there wasn’t enough flesh to enjoy inside the acorn squash I picked up. Butternut squash added nice contrast in color, flavor and texture to each bite of the red quinoa. Alternatively, this dish can be served without the acorn squash as shown in the photo below. MICROWAVE: Lay acorn squash cut side down and microwave and cook at 5 minute intervals until fork tender, about 7-10 minutes. BAKING UNWRAPPED: Place unbuttered and unseasoned acorn squash, cut side down on a baking sheet lined with aluminum foil. Add enough water to slightly cover the sides of the squash. Bake at 350F for about 35-40 minutes. Flip over, add butter & seasoning. Continue to bake until fork tender, 5-10 minutes longer. While training for Ironman Lake Tahoe, I had the pleasure of being coached by Jeff Pearson, one of the best open water swim coaches, Jeff Pearson, a professional swimming coach with 20 years experience, which includes, the USA National Team. As a swimmer, Jeff was also a member of the USA Swimming National Team and won the USA Swimming National Championship in the 10K open water. Jeff still holds the United States Masters Swimming 2 mile cable swim National record. I modified this recipe to create a burger with a sweet and spicy flavor. I replaced 1 (4 oz) can of diced chili with ½ cup of finely diced apple (1 medium apple). I am the social athlete. I never turn down an opportunity to have a meal with my fellow athlete friends. Last week I had the pleasure of dining with 4 other fellow female Ironman triathletes, two were racing a 50K marathon in the next 48 hours and I was racing a half marathon in the next 72 hours. 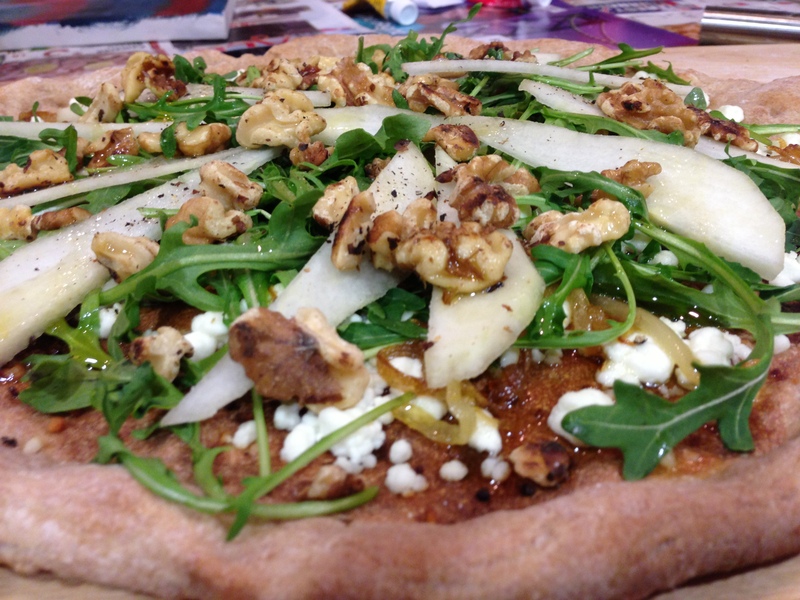 Our carbo-loading meal was a fabulous Pear and Goat Cheese Pizza. It was so good, I was still thinking about it this week and decided to make it. Since I’m the busy every day athlete, with competing fulltime responsibilities like everyone else, I take cooking shortcuts every chance I get. The big time saver for this recipe is buying the pizza dough. These days you can find a variety of pizza dough in your local supermarket’s freezer. 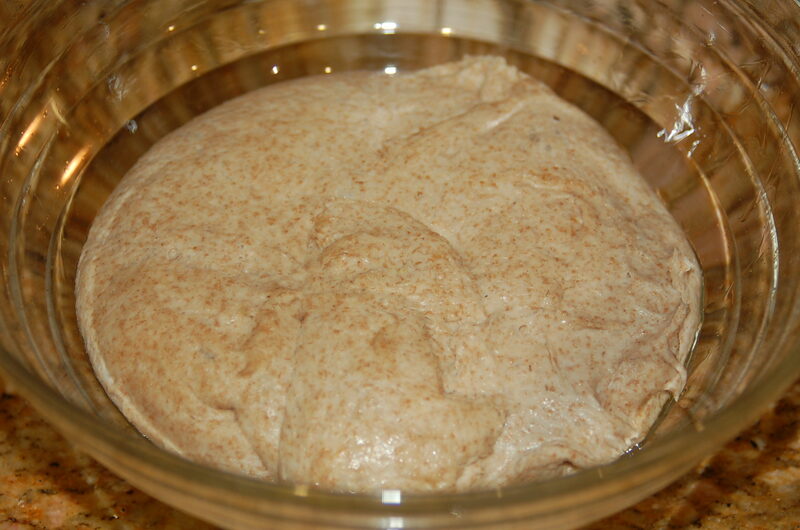 I decided to buy whole wheat dough, but you can also use multi-grain or traditional pizza dough. NOTE: I originally made candied walnuts to add to the pizza (in the photos), however the caramelized onions added enough sweetness. I ended up picking the walnuts off and enjoying them separately. Next time, I’ll use plain toasted walnuts for some crunch without the added sugar. Nuts, including almonds, walnuts, and pecans, have been shown to have heart healthy benefits, including lowering “bad” LDL cholesterol. Walnuts are also a source of omega-3. * NOTE: If you are a gluten-free diet, ensure that the ingredients you are using are gluten-free. Follow the instructions for the pizza dough. Usually the dough, if frozen, will need to defrost over several hours and then allowed to sit a few more hours in a bowl, greased with olive oil, until the dough doubles in size. 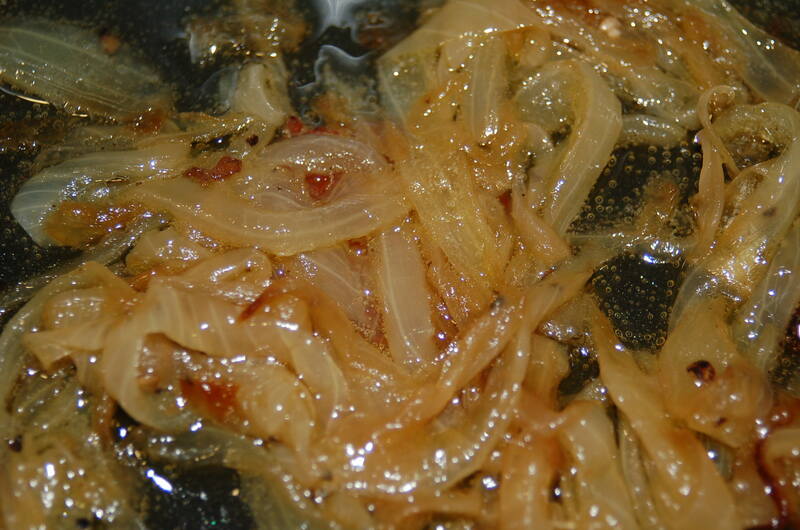 Cook onions covered in pan over medium/low heat with 2 tablespoons of olive oil and a pinch of salt and pepper. Cook for about 15 minutes until soft and caramelized. You may need to remove the lid to allow all of the liquid to evaporate towards the end of the cooking time. Allow to cool. The caramelized onions will be very sweet so a little bit added to the pizza will go a long way. Prepare pizza dough and place on pizza stone or baking pan dusted with corn meal. Bake pizza dough for about 10 minutes. Remove from oven and top pizza with goat cheese and bake for 10 additional minutes or until cheese is starting to melt. Whisk together remaining 2 tablespoons of olive oil, juice of 1/2 lemon and salt. Toss arugula and in olive oil and lemon dressing. 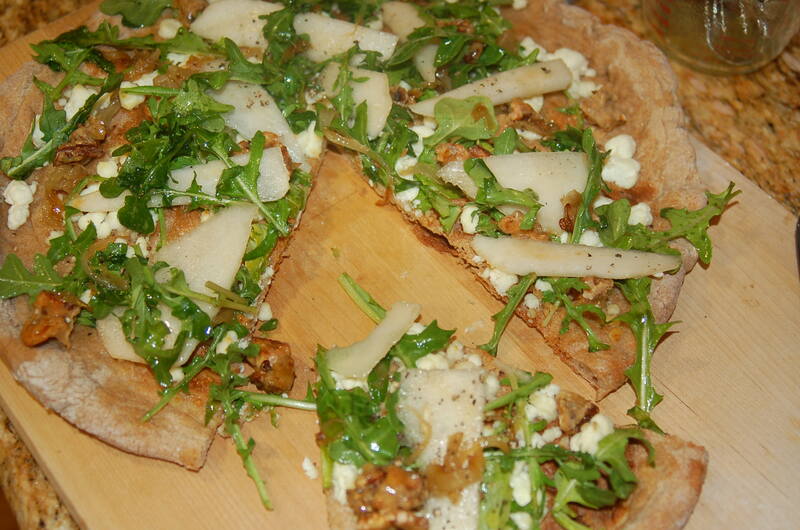 Remove pizza from oven and top with pears, caramelized onions and arugula. Season with freshly cracked pepper. For some extra crunch, top with some plain toasted walnuts.